Tired of the same old Swedish massage? Maybe it’s time to try something different at the spa. I’ve scoured the city to find the most unusual treatments available, from Hawaiian-style lomi lomi and a traditional Thai treatment (which uses pretty much the same ingredients as a delicious Tom Yum soup, but yeah, without the prawns) to a toe-wrigglingly good four handed royal massage and a foot treatment which features river rocks. Beg her to keep going. Maybe wail and plead for her to start again? Um, do you really think that would work? Seriously, this treatment at the Absolute Spa is one of the best treatments I have ever had. Tracy is a genius. A lom ilomi is a Hawaiian style of massage. Apparently it translates to ‘kneading like a contented cat’ and yes, that’s a pretty good description as I was all but purring at the end. Imagine long, flowing strokes from the top of your shoulders to the tips of your toes like a slowed down and warmed-up wave; those stubborn stiff muscular knots released by gentle ‘swishing’ strokes of your therapist’s fingers, elbows and arms. This treatment uses deliciously scented Whish coconut lotion, so breathe in and you'll feel like you've been transported to Hawaii. So, so good. Arrive early and you can take advantage of the spa’s excellent facilities: an ozonated swimming pool, eucalyptus steam room and relaxation lounge. Parking is complimentary and a crunchy bright chicken salad lunch is included, along with a Youngblood mineral makeup touch up. I loved the sound of this reflexology treatment as it began with a foot soak on river rocks, a pleasingly quirky touch to a therapy. There’s definitely something instantly calming about wriggling your toes in warm water and running the soles of your feet over stones. Straight away you’re in your happy place– barefoot and paddling a creek on vacation. Footworks focuses on reflexology treatments, although they also offer chair massages and body massages too. 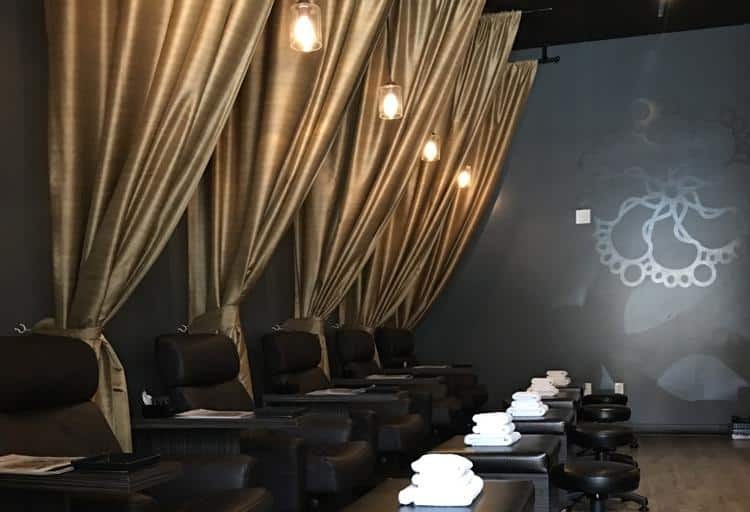 Great for solo spa-goers or friends, the shared-space spas in Kits and Point Grey have ultra-comfy recliner seats, and, top tip: if you’re trying to chill while a pair of chatty Cathys are gossiping opposite you, they do have ear plugs. I put mine in and snuggled under a blankie and let the world fall away as my talented therapist Amanda did her thing. Every time I have reflexology, I wonder why I don’t have it scheduled on a regular basis. This is a fantastic no muss, no fuss therapy which allows you to stay clothed, and walk out feeling completely rejuvenated from head to toe in just 50 minutes. See you soon, Amanda! East meets West in this stylish interpretation of an ancient holistic Indian medicine system at the Sense Spa at the Rosewood Hotel Georgia. The name Ayurveda comes from the Sanskrit words, ayur which means life and veda which means knowledge. The aim of Ayurveda is to seek balance of the mind and body and that’s exactly the journey on which this treatment takes you: from brisk exfoliation using a paste of aromatic herbs such as sandalwood, coriander, cardamom and valerian, and circulation-boosting dry body brushing to a soothing application of abyanga warming body oil with relaxing lavender, ylang ylang and ginger root. Then you’re wrapped in a cocoon to let the oils work their magic as your therapist sends you to straight to massage heaven with a pressure-point scalp treatment using oil scented with shikakai, ritha, triphala, neem and lavender. Book a cab home afterwards and make no plans for the evening; just let those oils soak in overnight and wake up to gorgeous hair the next morning and a calm and serene sense that yes, you’re ready to conquer the world again. I’ve always believed that I knew what it was to be happy. Turns out, I was wrong. I had this profound realisation as my clavicles and shoulders were being massaged at the exact same time as my feet. 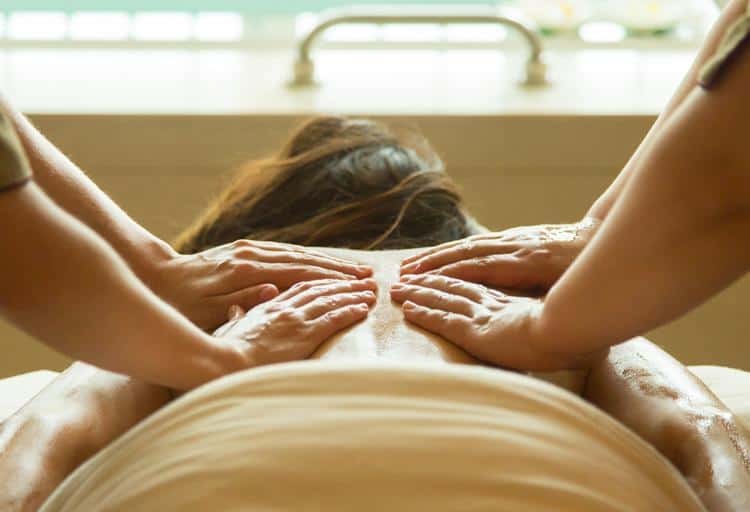 True happiness, it turns out, might only be possible through the medium of Chi Spa’s Royal Duality treatment, which delivers 90 minutes of transcendent delight with two therapists simultaneously giving a four-handed massage. 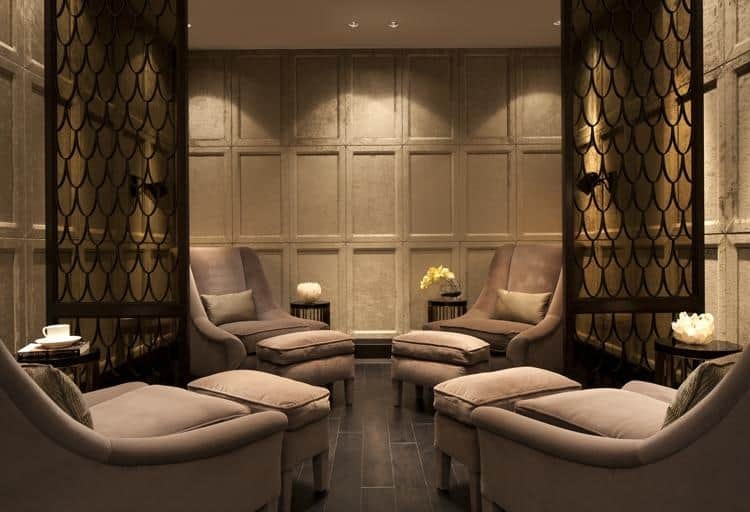 The sensation of two pairs of incredibly skilled hands smoothing and soothing my muscles in perfect unison will stay with me for a while—the Chi’s zen-like treatment room is basically my new happy place. 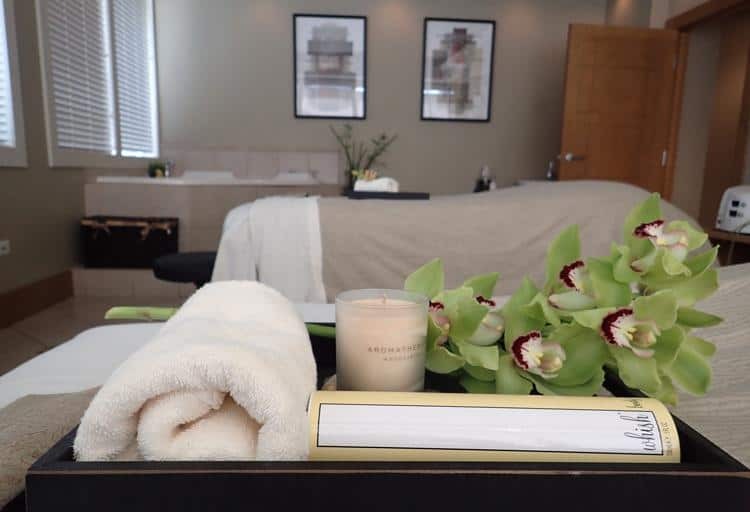 I’ve written before about my love of the Chi Spa and I really think nowhere in Vancouver can offer such a superbly luxe pampering experience. I felt coddled and spoiled and my mood totally switched from stressed out to feeling I was floating on clouds. The first portion of the massage focussed on long, slow synchronized strokes; the second split focus with one therapist at my feet and the other my head, both of them working intently on relieving any knotted muscles. Sure, this isn’t an inexpensive treatment but sometimes you absolutely have to treat yourself (or someone you really love). Worth every single cent... I’ve still got a smile on my face days later. Got a stubborn tight muscular problem that just won’t loosen up? Take a stick to it. A heated one that is, over at the exclusive RedCedar at the Four Seasons hotel. Booking an appointment at this spa is one of the city’s best deals as you get access to their spacious Club Four pool deck and fitness centre too with its indoor/outdoor pool, sauna and whirlpool. Grab a lounger post-massage and spend the afternoon chilling out. But, back to that stick—or ‘stix’ as they call it here. This is a new twist on hot stone therapy, which uses specially designed batons (‘thermal stix’) which are heated and exactly the right shape for releasing and softening tight muscles. Combine heat with a rolling motion and gentle pressure and say bye bye to that stiff lower back, or those tight hamstrings and hip flexors. I had no idea this spa existed and quite frankly, I’m furious that no one told me about it sooner! Tucked away up a flight of stairs in the 200 block of Robson Street, opposite the very delicious Ramen Jinya, now you can take a trip to Thailand without even leaving B.C. Brand new in this location from September last year, Smile Thai Wellness has 14 themed treatment rooms, all based on places in Thailand. I adored the Phuket room which has a genuine beach spa vibe: swagged curtains, the sound of the waves crashing on the beach and a shimmering video of the sand and the sea on the wall. So cool! I tried their signature poultice massage which uses a steamed compress of aromatic, tension-relieving herbs including ginger, lemongrass, bergamot and tamarind leaf. The treatment begins with an aromatherapy oil massage to warm up your muscles, then the steamed poultice is applied in a swift almost stippling movement, rolling and soothing tight muscles in an incredibly gentle way. It’s also said to be beneficial for circulation, aiding relaxation and soothing tension. As an added benefit, the combination of heat and the herbs have a terrific effect on your oiled skin, I have never felt so silky smooth in my life! Too many spa and beauty products make claims to be life changing but trust me: no facial scrub can change your life, but what might is Hälsa Spa’s ‘Eight-hour Mongolian Journey’ with therapist Michael Strickland. This is no quick fix, but more a step towards making major life changes with the guidance of a therapist who uses techniques learned whilst apprenticing with a 93 year-old shaman in Dalazadgad. The process requires quite a commitment: a three-day fast, hours of massage, some profound emotional release work on the areas in your body which hold the most ‘frozen’ pain, rebalancing shamanic energy work and finally a nurturing lomi lomi massage. I tried a two-hour version and it amazed me how profound its effects were. This is no ordinary massage. 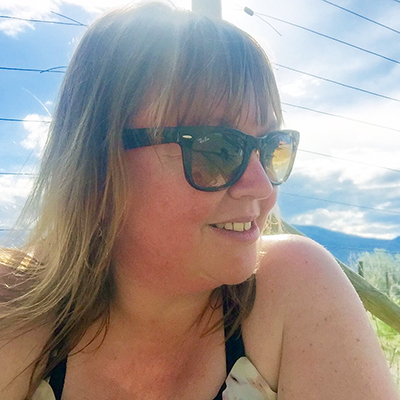 I had a couple of intense realisations during the treatment and left feeling drastically different. If you feel you’re ready to try a major change and want to invest the time and money, this could be exactly what you’re looking for. However, if that’s too much investment right now, you can book for a two-hour taster like I did, or maybe try their float facilities instead. I loved their spacious high-tech, ultra-clean cabins and float tanks. 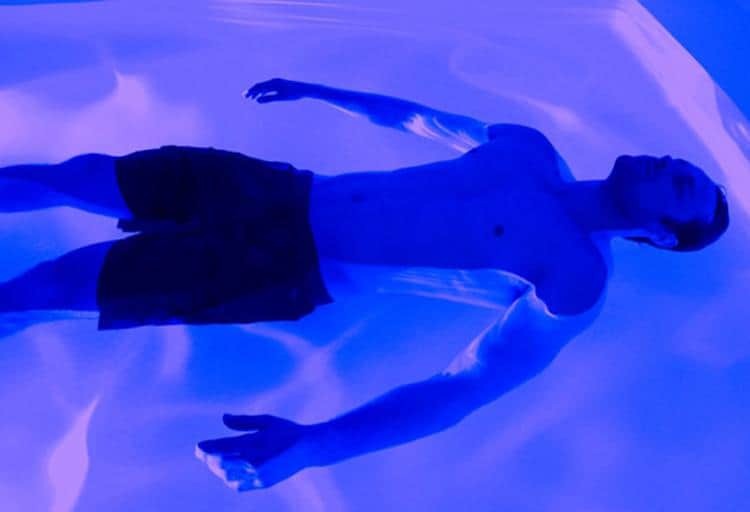 At $39, it’s a fantastic price for an hour of weightless floating, slowly stretching your body and letting your mind relax and spin out into a meditative state.